American Alligator (Rana capito) SSC- Alligators occur from southeast Oklahoma and east Texas on the western side of their range to North Carolina and Florida in the east. They prefer fresh water lakes and slow-moving rivers and their associated wetlands, but they also can be found in brackish water habitats. American Alligators are an elongated reptile with muscular flat tail and long, round shovel-shaped snout, with armored skin on their back. Roughly one million alligators live in Florida. The average clutch size of an alligator nest is 35. From this, an estimated 15 live hatchlings will emerge. Only 6 alligator hatchlings will live to one year. Of these yearlings, 5 will become sub-adults (reach 4 feet in length). The number of sub-adults that reach maturity (6 feet in length) is approximately 4. After nearing extinction in some areas 30 years ago, the American Alligator has recovered significantly. Protection of wetlands and strict penalties for poaching have helped. The alligator retains its protected status due to its close resemblance to the crocodile. American Crocodile (Crocodylus acutus) Endangered- American crocodiles live in coastal areas throughout the Caribbean, and occur at the northern end of their range in south Florida. They live in brackish or saltwater areas, and can be found in ponds, coves, and creeks in mangrove swamps. Unlike the American Alligator, the American Crocodile has a narrow snout, and both upper and lower teeth are exposed on the crocodile when his mouth is closed. 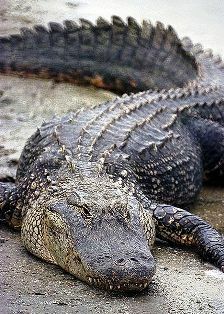 American crocodiles are more of a grayish green in color, while alligators are a darker black. Crocodiles can be seen sunning with their mouths open, or “gaping.” This behavior is related to regulating their body temperature, and does not mean that the crocodile is acting aggressively toward people. 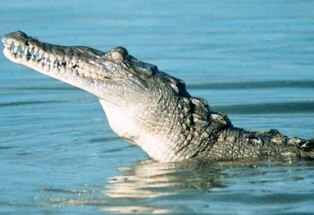 The American crocodile is so rare and shy of man that conflict with people rarely occurs. Crocodiles eat almost anything that moves and some things that do not, and the bigger the crocodiles, the bigger their prey. Hatchlings and young crocodiles eat small fish, snails, crustaceans, and insects. Adult crocodiles feed at night on schooling fish, crabs, turtles, snakes, and small mammals. Large crocodilians can crush turtles and prey upon deer and other unwary large mammals near the edge of water. Key Ringneck Snake (Diadophis punctatus acricus) Threatened- The Key Ringneck snake is a non-venomous snake found only on the lower keys including Big Pine, Little Torch, and Middle Torch. It is not found outside of Florida. Due to its very small range it is listed as a threatened species in the state of Florida. The Key Ringneck's habitat consist of pinelands, tropical hardwood hammocks, and around limestone outcroppings. The average adult size is six inches long. Adults are small and slender-bodied with a slate gray body. 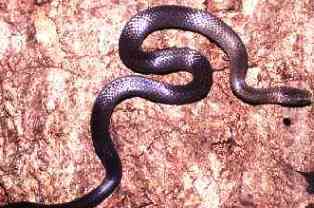 Unlike other ringneck snakes, the ring normally present around the neck is indistinct or completely absent. The belly is bright yellow, fading to orange-red beneath the tail. There is a single row of half-moon spots down the center on the belly. 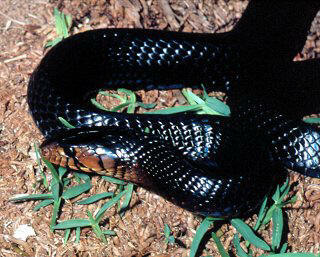 Eastern Indigo Snake (Drymarchon corais couperi) Threatened- The Eastern Indigo Snake is found throughout Florida and southeast Georgia. Indigos, are non venomous snakes that are widespread throughout the state, but nowhere are they abundant. They occur in hardwood forests, moist hammocks, pine flatwoods, prairies, and around cypress ponds. Because it seeks refuge in gopher tortoise burrows, along with diamondback rattlesnakes and many other organisms, in some parts of Florida the indigo is called the 'gopher snake'. The Eastern Indigo snake is a long snake, averaging from 60-74 inches but the record length is 103 inches long! Adults are large and thick bodied. The body is glossy black and in sunlight has iridescent blue highlights. The chin and throat is reddish or white, and the color may extend down the body. The belly is cloudy orange and blue-gray. Red Rat Snake (Elaphe guttata) SSC- The red rat snake, often called the corn snake is a colorful non venomous snake found in the Florida peninsula. The corn snake is primarily active at night. It is both a terrestrial borrower and extremely good climber. It is found under rocks and logs, and in trees under bark and within palm fronds. Adults are usually 18-44 inches long but have been recorded as long as 72 inches. 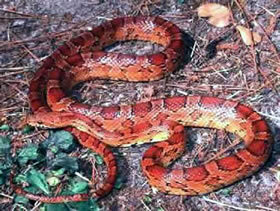 Red rat snakes are orangish-brown with black bordered orange, red, or brownish blotches. The belly usually is a black and white checkerboard pattern, though orange may also be present. The underside of the tail has 2 black stripes. There is a spear-shaped pattern on the head and neck.